Thermotoga is typically a rod-shaped cell enveloped in an outer cell membrane (the 'toga'). Thermotoga enzymes are known for being active at high temperatures. Thermotogales are extremely thermostable and therefore useful for many industrial processes such as in chemical and food industries (R. Huber et al., 2004). Thermotogales are thermophilic or hyperthermophilic, growing best around 80°C and in the neutral pH range (R. Huber et al., 2004). The salt tolerance of Thermotoga species varies greatly; while some display an extremely high salt tolerance, others are restricted to low-salinity habitats. This aerobic gram-negative organism is typically nonsporeforming and metabolizes several carbohydrates, both simple and complex, including glucose, sucrose, starch, cellulose, and xylan (EBI, 2003). The L-alanine production of Thermotogales is similar to the achaeal Thermococcales, suggesting that L-alanine production from sugar is a trait of a former ancestral metabolism (R. Huber et al., 2004). 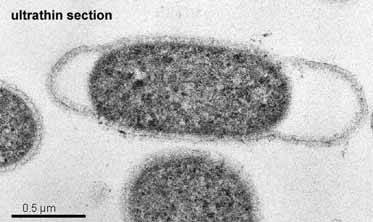 Thermotoga bacteria has an upward growth limit of 90°C , making it among the bacteria group with the highest known growth temperatures. Thermotogales typically grow in low salinity volcanic or high-temperature habitats such as shallow or deep-sea marine systems and continental oil fields. T. maritima was first isolated in Vulcano, Italy from a shallow marine sediment that was geothermally heated . The next species found was T. neapolitana, found in a thermal submarine vent near Naples, Italy. The newest Thermotoga species BB13-1-L6A lives in heated waters close to 68°C with a pH of 6.8 in Germany (R. Huber et al., 2004). The Institute for Genomic Research, Rockville, Maryland 20850, USA. Nelson KE, Clayton RA, Gill SR, Gwinn ML, Dodson RJ, Haft DH, Hickey EK, Peterson JD, Nelson WC, Ketchum KA, McDonald L, Utterback TR, Malek JA, Linher KD, Garrett MM, Stewart AM, Cotton MD, Pratt MS, Phillips CA, Richardson D, Heidelberg J, Sutton GG, Fleischmann RD, Eisen JA, Fraser CM, et al., Nature 399(6734):323-9 (1999 May 27). Questions or comments? Please use our feedback page! BacMap version 1.0.